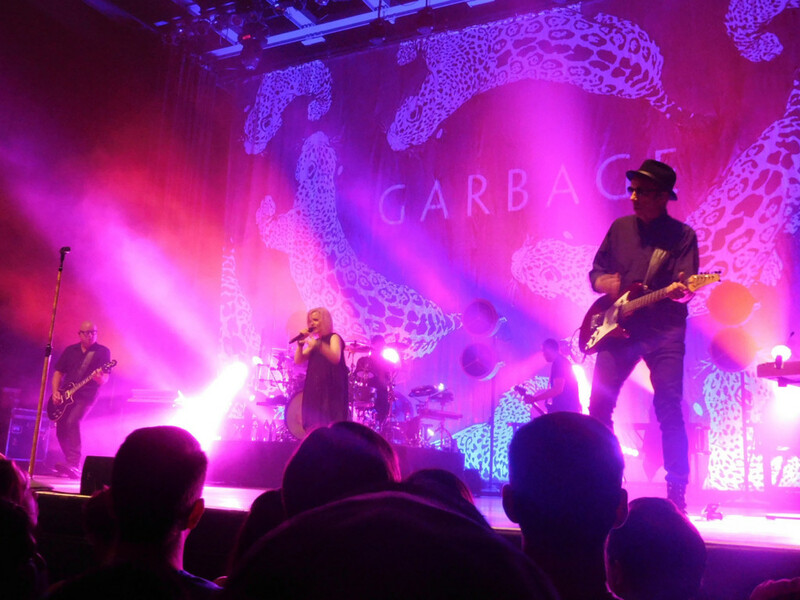 Check out this CUSTOM mixed media BACKDROP that we produced for GARBAGE. Digitally printed in house on our very own 10 foot wide Vutek printer – and then custom sewn and crafted hot pink mylar sparkle cloth appliqued to the piece in all the right places. WOW! totally cool – search for the band online and see lots of audience videos with this specialty drape. Just like your audience, you want top performance. Sew What? delivers! Our Stage Curtains and Theatrical Draperies, Stage Backdrops, Curtain Tracks and Theatrical Supplies exceed your expectations and enhance your shows. 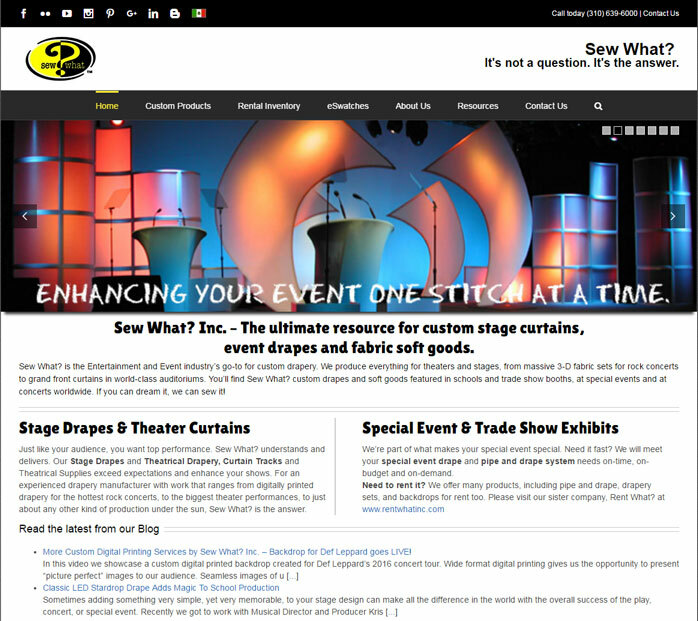 With experience that ranges from the hottest rock concerts to the biggest stage events to just about any other kind of production under the sun, Sew What? is the answer. Brainspoon is a rock ‘n’ roll punk band based in Los Angeles, California. A staple of the Downtown Los Angeles rock scene, the band has earned a solid reputation with its blistering live show and catchy songs. 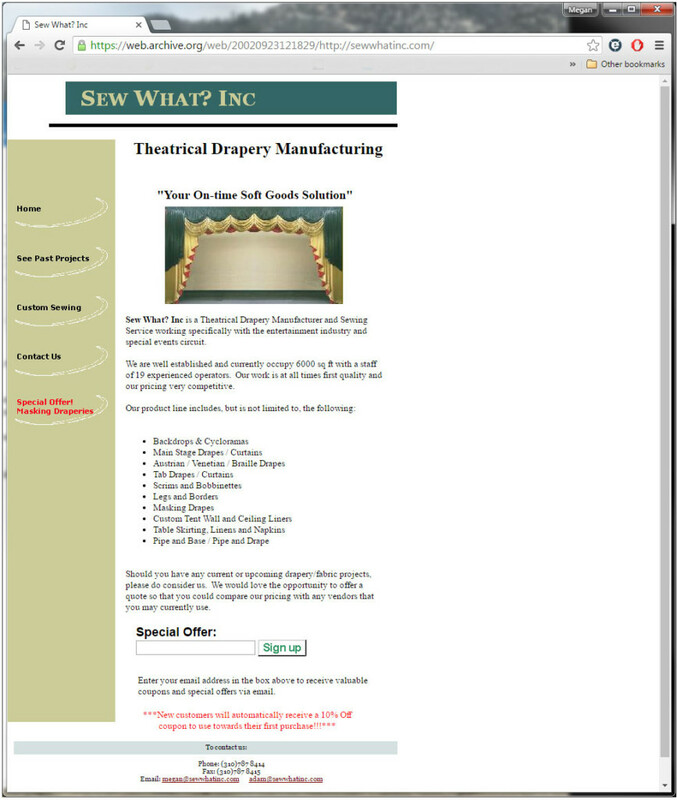 Sometimes, a customer wants the look of an Austrian Curtain, but doesn’t have the need (or required equipment) for the drape to lift. The solution? A non-operable Austrian Curtain. A non-operable Austrian Curtain has the appearance of a standard (operating) Austrian – all the smiles / small swags – without the D-rings on the back. Since it will remain in a stationery down position, no complicated lift system is required. The curtain is sewn with a standard top finish – typically webbing with sewn twill ties – and tied directly onto truss. The curtain serves as a beautiful backdrop to the show or special event, without the added expense or hassle of a lift system. For example, we had a customer, Audio Dimensions of Albuquerque, purchase a gorgeous non-operable Austrian. 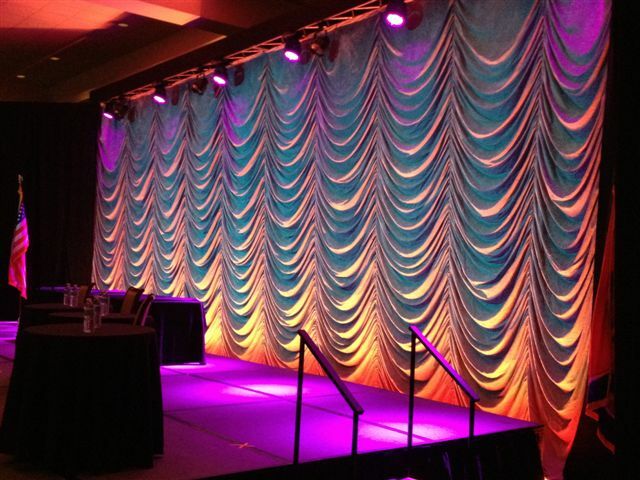 At 16′ h x 40′ w, this Grey Super-Vel drape looks beautiful under lighting. Take a look at these images – I’m sure you’ll agree! Another option is to rent a non-operable Austrian. 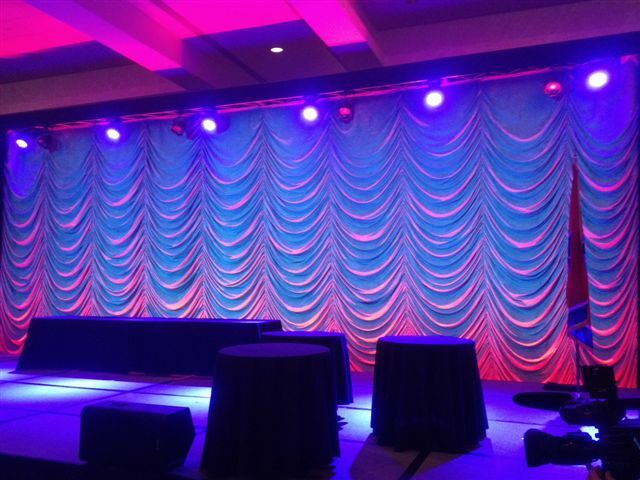 Our rental Austrian Zip-Walls give you the flexibility to vary the width of the drape. Available in both White (Snow) and Silver Textura, these Austrian Zip-Walls are 12’ h x 10’ w, and can be hung on standard pipe and base hardware. You choose the number of drapes needed to achieve your desired drapery width and then zip them together. Want a 50’ wide drape? Just rent 5 Austrian Zip-Walls. Naturally, there are times when nothing but an operable Austrian Curtain will do. Consider the drama of an Austrian Curtain slowly raising to reveal the scene behind. In this instance, a rental lift system with a purchased (or rented) operable Austrian Curtain is the way to go. But if you are looking for a gorgeous backdrop to a show or event, and you don’t have the need to lift the curtain, consider the possibility of a non-operable Austrian. Sew What? Inc is getting ready to launch a NEW MOBILE FRIENDLY WEBSITE! We are getting super excited here at Sew What? Inc – as after *many* months of planning and redesigning of our website – we are getting dangerously close to going live with our new mobile friendly website. We have been working with programmer Beth Nikodem of Orange County Web Design (http://www.orangecountywebdesign.com/web_design_copywriting.html) and Cindy McMahan of Search Marketing Pros (http://www.searchmarketingpros.com/). Beth and Cindy been integral in our website SEO, design, functionality and coding since around 2008. Hand in hand, we have been through many incarnations, and adjusted along the way to the need of both our growing business as well as changes in internet search engine protocol. Staying present in the top pages and ranking well organically has always been our website focus. In planning the new, mobile friendly site, we took all the most popular information and pages from our existing website, and then took out all the “duplicitous, obsolete and just plain old boring” information – to come up with a better express experience for our website viewers and readers both at their computers AND on their mobile devices. Continuing to focus on an “educational” approach, and still including lots of inspirational images… we are excited about these fresh and modern changes to our site, all resulting in a better and more engaging website experience. In looking back over the years, we have really come a VERY long way. The first website in fact was built in Publisher back around 2002…. I built it myself one weekend……..clip art and all! As embarrassing as that might seem, it was the beginning of many things to come- and I am still able to reflect on the old site with some pride! Our first online presence is something to remember. We are really looking forward to announcing our launch date (which will be very soon) – and we will be sure to share the news via the blog as soon as we do go live. Thanks to all our clients and friends and family that have been with us through all our web-incarnations… the good, the bad and the non-functioning…. Mobile friendly – here we come! More Custom Digital Printing Services by Sew What? 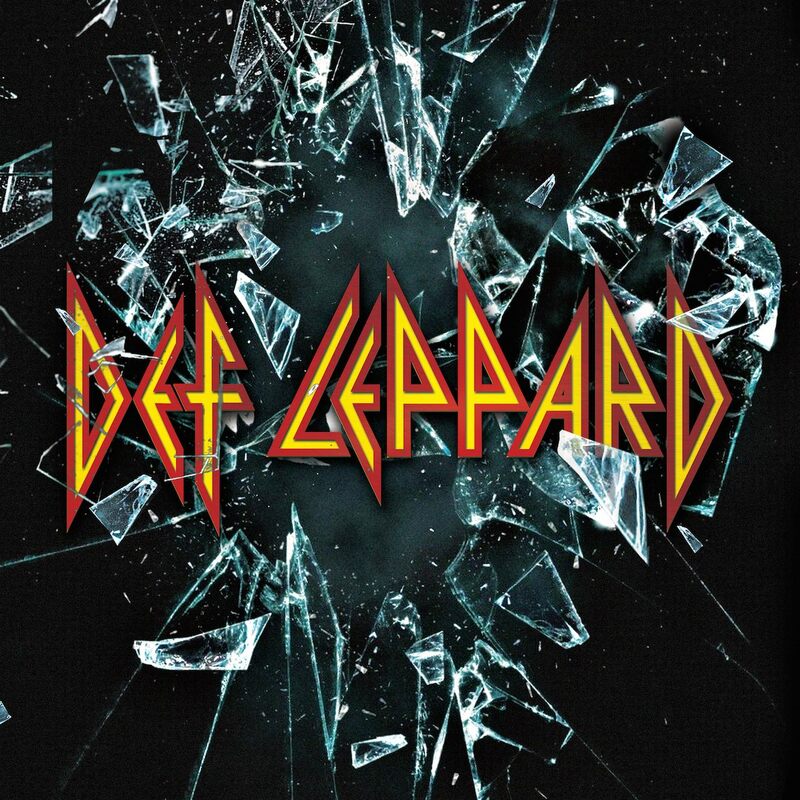 Inc. – Backdrop for Def Leppard goes LIVE! In this video we showcase a custom digital printed backdrop created for Def Leppard’s 2016 concert tour. Wide format digital printing gives us the opportunity to present “picture perfect” images to our audience. Seamless images of up to 10′ wide can be produced, and a variety of fabrics – both for indoor and outdoor use – are available. Sew What? Inc is your source for quality digital printed products and informative and friendly service. In this video we showcase the custom backdrop printed for rockstar A-Listers Def Leppard. It’s OK! was founded by Redd Kross guitar guru, Robert Hecker. He is abetted by his long-time musical cohort, vocalist Ellen Rooney, and the crushing rhythm section of bassist Dennis McGarry and drummer Joey Mancaruso. They base their operations in a secret lair somewhere in the South Bay Area of Los Angeles. Their third album, Cubed, will be released in 2015.